After being the only one trying White Restaurant, The Original Sembawang White Bee Hoon for the first time, was again the only one in our group of five who have not been to Time Table café. The latter first opened at East Village in 2014 and expanded its presence to Jurong West last year. Visited its second branch, which happened to be having promotions for its 1st anniversary. Having heard so much about its Vongole Spaghetti, I decided to order that. Al-dente pasta with clams I have no complaints about, in light and clear soup that was not too oily. Accentuated with the aroma of sliced garlic and Chinese parsley (had mine without chilli), it was refreshing and I slurped it all up. 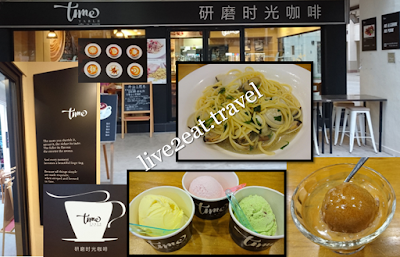 Chose chocolate ice-cream for my affogato – a perfect combination, and shared a not-too-sweet waffle with my dining companions. Also tried and could not fault its strawberry, durian and mint ice-cream.